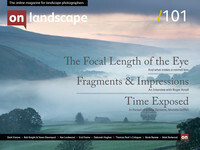 Whilst putting together the pub quiz for our landscape photography conference last year, David Ward and I wanted to add the question "What focal length is the eye?". Little did we know that trying to get an answer for this would take most of an evening and some of the next day. It turns out that things aren't as simple as you think. One of the first conclusions that people might jump to is that the eye is the same as the ‘standard’ lens. 50mm produces a natural looking picture and it’s chosen as the default lens for our cameras (or it used to be) so is this a possibility? In short, no. It’s simple to check your peripheral vision and see that we actually have a very wide field of view. If you do a little research on what a ‘standard’ or ‘normal’ lens is defined as, it’s all a bit wooly. It’s the focal length that has the same angle of view as a print held at a 'normal' viewing distance (approx 53° diagonally). This has ended up as being roughly the diagonal of the film format, hence for 35mm full frame cameras the focal length that is normal is approximately 43mm. The focal length of a lens is defined as the distance from the centre of the lens (or the principal focal point) and the sensor surface (the back of the retina). For the typical human eye this distance is approx 24mm from pupil to the back of the eye. However, this calculation for focal length presumes a flat 35mm sensor. The 'sensor' in the eye is on the internal surface of a the eye (a sphere) and definitely isn’t 35mm across! So we need a different way of calculating focal length. It might make more sense to look at the angular light sensitivity of the eye. Here is a diagram showing the distribution of cones and rods in the eye.